Ideal for encouraging outdoor play. 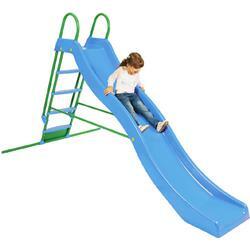 The Slide Chute is 9 long and made of smooth durable resin. Metal frame construction with safety handrails and support poles. Fade and rust resistant powder coat finish with non-slip resin steps.